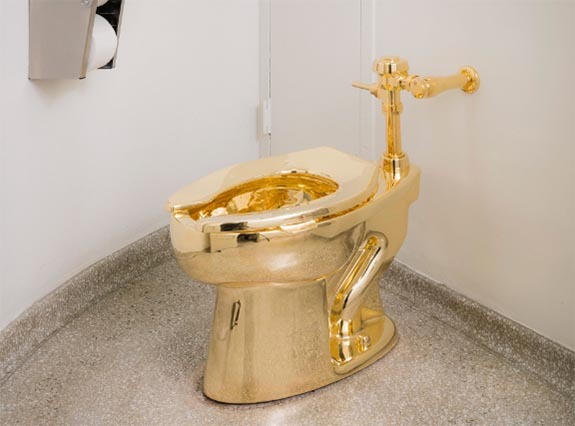 Italian artist Maurizio Cattelan’s 18-karat gold toilet at New York’s Guggenheim Museum is giving the notion of “sitting on the throne” a whole new meaning. Visitors who pay the museum’s $15 admission fee are encouraged to stop by the unisex washroom on the fourth floor, where they can take a private moment with a fully functional commode fit for a king or queen. The exhibit opened on Thursday. “This is 1 percent art for the 99 percent,” he told the New York Post. Catalan’s artwork has generated a buzz throughout traditional and social media. CBS News’ “Sunday Morning” ran a segment about the exhibition yesterday and the The New York Times posted its review last Thursday. Kennedy noted that the “America” exhibit will remain in place and in use indefinitely.